Saturday is my favorite day of the week because on Saturday night it’s The Miss Luci show. If you read this blog you know that to be certitude. Oh yeah! 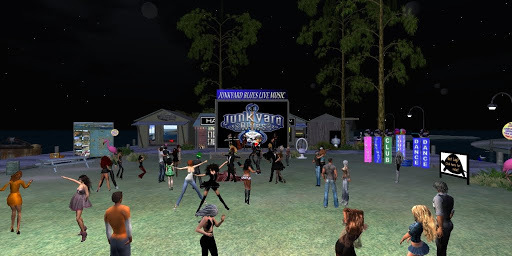 But in the past few weeks the Junkyard has been followed by a concert series and this week it was the Choo Choo Chics. Hooo! And they are as cute as their name and a great act too. It is great to be back hosting for Luci, but the crowd pouring into Junkyard Blues was very large in the 50+ range all night. Luci spun some great blues and I seemed to be on speed because I was wailing and carrying on. hehe. It’s hard to explain but I really enjoy greeting all these people. I guess it takes all types to have a second life. The crowd was huge for the Miss Luci Show. After my gig with Luci, we all headed over to JY South for this new act, The Choo Choo Chics. They were broadcasting to us LIVE from Red Lotus Records in Chattanooga, Tennessee. Here’s the lineup: Angua Ashbourne, lead singer; Mishkamenges Collazo, keyboard; and Lotus Melodie on guitar. The band included Ashenden Aulder, bass; DrJ Darkfold, drums; Parker Soulstar, sax; and Theo Seidel on guitar. I love the performers at the Junkyard but every once in awhile they bring in an act that makes me smile from ear to ear. YAY Choo Choo Chics!! 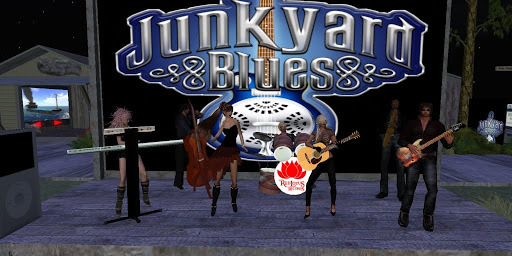 The Choo Choo Chics debut at Junkyard Blues South!!!! The Yard was packed and lots of new peeps. Hey, even Kia tp’d in. Yay Kia. It was a fantastic evening for me. I met some new people. I hungout with so old friend and got to know him on a whole new level. It was just one of those days when things were right and this artifical world was good. I know, maybe it all just seemed great because I had been so sick with that danged walking pneumonia, but hey, hey! 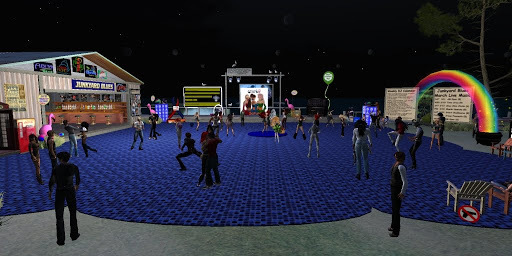 I just might spending more time in Second Life.